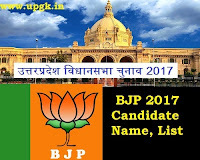 Bharatiya Janata Party (BJP) Candidate 2017 List, Names: Bharatiya Janata Party (BJP) has already announced the First list of 149 candidates of UP Assembly Election 2017. BJP's Central Election Committee (CEC) held a meeting to finalise its candidates for Uttar Pradesh. Union minister JP Nadda announced the release of list carrying names of 64 candidates for the upcoming election in Uttarakhand and a list of 149 candidates for the Uttar Pradesh Assembly election. In Uttar Pradesh, which has a 403-member House, polls will be held on 11 February (73 constituencies), 15 February (67 constituencies), 19 February (69), 23 February (53), 27 February (52), 4 March (49) and 8 March (40). BJP First list of 149 candidates of UP Election 2017. BJP Second list of 155 candidates of UP Election 2017. BJP Third list of 67 candidates of UP Election 2017.